Despite the current economic acceleration, Latin America’s output growth is returning to an underwhelming mean. Benefiting from these better global conditions, Latin America’s economic recovery is gaining momentum too, as recessions in a few countries come to an end (Brazil, Argentina, and Ecuador). We now estimate regional growth at 1.3 percent in 2017 (up from 1.2 percent in our October projections), and we project activity to accelerate further to 1.9 percent in 2018 and 2.6 percent in 2019. Consumption and exports were the main growth drivers last year. Encouragingly, investment is no longer a drag and is expected to be an important factor behind the acceleration in output this year and next. Inflation came down significantly in 2017 in many countries, providing some scope for easing monetary policy. The recovery is broad based across the region. While Mexico, Central America, and parts of the Caribbean are benefiting from stronger growth in the United States, growth in South America is mainly driven by the end of recessions in Brazil, Argentina, and Ecuador as well as higher commodity prices. Mexico’s outlook is projected to benefit from higher growth in the United States, although uncertainty about the outcome of the North American Free Trade Agreement renegotiation and Mexico’s July presidential election will weigh on growth in the near term. To this end, output growth is projected to accelerate from an estimated 2 percent in 2017 to 2.3 percent in 2018. Inflation is expected to fall sharply in 2018 as the effect of last year’s increase in administered domestic fuel prices fades. Continuation of prudent fiscal policy aimed at a reduction of the public debt ratio is key to maintain macroeconomic and financial stability. 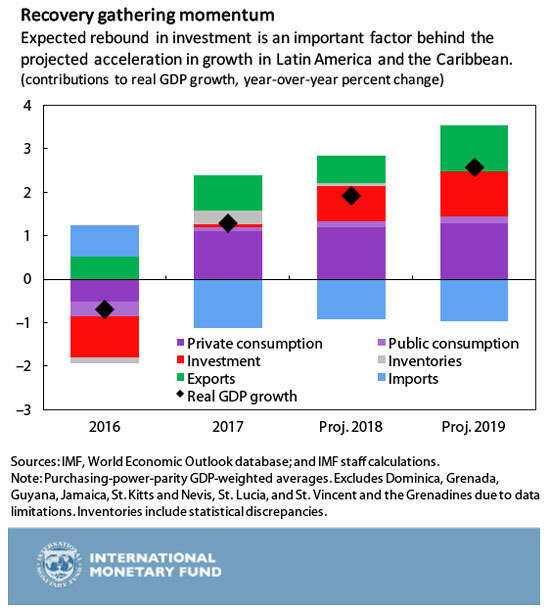 In Brazil, after a severe recession in 2015 and 2016, the economic recovery is gaining strength, spurred by private consumption and investment. Inflation in 2017 fell to 3 percent, driven by a sharp decline in food prices due to an exceptional harvest. Our forecast for Brazil’s growth in 2018 has been revised up significantly relative to the October 2017 WEO. However, the uncertain outcome of the 2018 general elections may weigh down economic growth. To ensure fiscal sustainability, the Brazilian authorities plan to undertake a prolonged fiscal consolidation, which includes an ambitious reform of social security. Ecuador’s economy had a speedier-than-anticipated recovery in 2017, with growth estimated at 2.7 percent. The recovery was supported by the partial recovery in oil prices and increased access to international financial markets. The new administration is making efforts to engage with the private sector and tackle corruption, which could benefit the economy in the longer term. However, in the short term, the economy remains vulnerable to external shocks, calling for reducing the fiscal deficit and regaining competitiveness through structural reforms. In addition, financial market conditions could tighten if inflation increases more than expected in the United States or if global financial vulnerabilities build up due to excessive risk taking during the long-lasting period of very low interest rates and low asset price volatility. In countries where fiscal deficits need to be lowered, attention should be given to the fine balance between.